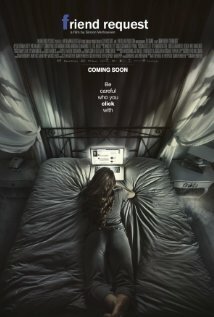 'Friend Request' is a supernatural horror film that's events take place due to the suicide of a teenage girl. To exact her revenge in a demon form, she will ruin the reputation of one of the most popular girls and looks to cause havoc on the lives of her friends. The social networking sites these people use may just be the demise for them as she uses them against her victims. Wait a minute..... didn't this already come out last year? Not only does the plot carry a lot of similarities to last years 'Unfriended' but the original name was almost identical. In Germany the film is still called 'Unfriend' but was changed elsewhere to avoid confusion with Blumhouse Productions internet horror. It has even been considered to just simply be the German version of 'Unfriended' although taking different routes in the story and different techniques in the filming. Although there are comparisons between the two, 'Friend Request' overall is the superior film. One of the strongest points of this film comes at the start as we see what goes on to cause the death of 'Marina' (Liesl Ahlers). We get introduced to our protagonist Laura Woodson (Alycia Debnam-Carey) who is one of the prettiest and most popular girls and has over 800 friends across her social networking sites. Marina wants to have that feeling due to being lonely ever since she was a child. We see some good character in Laura as she is kind and welcomes Marina to being her friend and even takes an interest in her creative- but very creepy and odd- videos and pictures. Due to this, you grow a liking to Laura and then you have an interest in the main character. To me, that's quite refreshing. How many horrors do you watch and you just cannot stand the main character. It's good to have someone who you'd actually like to see still alive by the end of the run time. The way that Marina acts towards Laura continues the creepiness and really is stalker like which makes Laura very uncomfortable. She tries to deal with this as nicely as possible without trying to hurt her new friends feelings but Marina doesn't see it this way and confronts her. These parts have some sort of realism within them as Laura doesn't necessarily do anything wrong and acts how I feel most people would be in order to not hurt someone's feelings. Again this adds to our character as she isn't just some sort of ruthless bully in this situation and does try to defuse this confrontation. The realism is added with the real effects used on social networks whether it is from text alerts to Skype calls that was also apparent in 'Unfriended'. The drama that has unfolded then makes Laura to cut connections with Marina and gets on with her life. Unfortunately this isn't the case for Marina who takes her own life. Now this is when the horror fans get to dive into what they paid to see. Marina had recorded her brutal suicide and back in demonic form, is here to cause great devastation to Laura and aims to make her feel as alone as she was. Everyone close to Laura is in danger and Laura herself is not safe but in a different way. Each time something happens, the recorded footage winds up appearing on her timeline which she cannot do anything about. Now this part of the film drew mixed reactions from me. The horror elements of this film did bring out some very creepy scenes and there was a lot of tension building up waiting for scares to deliver. However like a lot of horror films, there are some moments that are pretty ridiculous that might make it hard for the viewer to not laugh at. For instance there is a scene in which one of Laura's friends is in a hospital bed and she sits up like 'The Undertaker' which seems to be a near perfect imitation. 'Friend Request' really had the potential to be more than just a fairly good horror movie. The reasoning to why these things were happening and how Marina was able to do this was quite clever and in depth relating it way to back to old folklore about witches. This was a great way of telling a story about demonic presences but in a modern way that will appeal to the youth in countries that use the forms of communication. It wasn't just 'oh no the computer is haunted and now bad things are happening'. Credit to the writers for taking the time to look through old rituals to add to the story which was much a better reasoning rather than just 'evil'. There is also a pretty surprising twist within the film that came fairly unexpected. This is especially so when you consider the two characters involved and the suggested history between the two and what is shown on screen. Most definitely something I didn't expect and it worked to good effect. However that may be the case, the film does let it's self down at points. As I mentioned before, the film really created some creepy atmospheres and settings that are the stuff from nightmares- which is literally true in this film. Although they do this, the end product is mainly just a loud noise going off or something jumping out at you. Two of the cheapest tactics that can be used in the horror genre and unfortunately, they were deployed more often than I would have liked. I also mentioned that I had a particular liking for the main character throughout the film. The feeling wasn't mutual for a handful of her friends who straight from the start carried the trope of having annoying characters in a horror film. There stupidity isn't more clear than when Laura alerts them that she is not the one posting these messages. She is even in the company of her friends when these posts are being published and has them watch as she tries to not only delete the posts but also her entire page. However this doesn't stop them from questioning her and accusing her of doing these terrible things. As we've seen Laura and co desperately try to stop this, the scene in which they seem to turn against her do seem quite dumb. Now we've had 'Unfriended' and 'Friend Request', what's next? Blocked? DM'd? Poked? Hopefully not the last one actually. Anyway who knows what will be the next in what seems like a new trend for the horror genre. In fairness if it can follow and improve from 'Friend Request', I am all for it. The film most definitely surprised me and has some great moments within it. However there are some negatives that hold the film back for me. So have you seen 'Friend Request'? If so what did you think of it? I hope this review was useful and maybe convinced you to go and check it out sometime. Once again thank you for reading, it is much appreciated!